How do I get Out There/ where can I park? Through the wardrobe, down the rabbit hole, walk past the house made of cake, up the beanstalk and down the Acle straight. BUS: First Eastern Counties, X1 Service from Lowestoft and Norwich run regularly on Saturdays and Sundays. Plan your magical mystery tour here. Anglian Buses also run regular services from Norwich and east coast areas. Find out more here. All buses arrive at Market Gates, a few minutes from north of St. Georges Park. I want to stay over. Where can I find out about accommodation options? Great Yarmouth is one of the country’s largest seaside resorts so you’ll find accommodation options for every budget. From camping and economic guest houses through to 4 star hotels. You’ll finding a handy starting point right here. Over ten successful years of bringing the weird and the wonderful to Great Yarmouth, we are looking forward to Out There 2018, ram-packed full of fantastic family entertainment, free circus and street arts and plenty to see and do… so yes, it will be fun! OK, it sounds like fun, is it going to be free? All of the festival programme this year will be free to all. Alongside all the free goodness, we generally stage a handful of ticketed shows. 2018’s festival programme is now available here. Our traditional festival hub is in St. Georges Park. 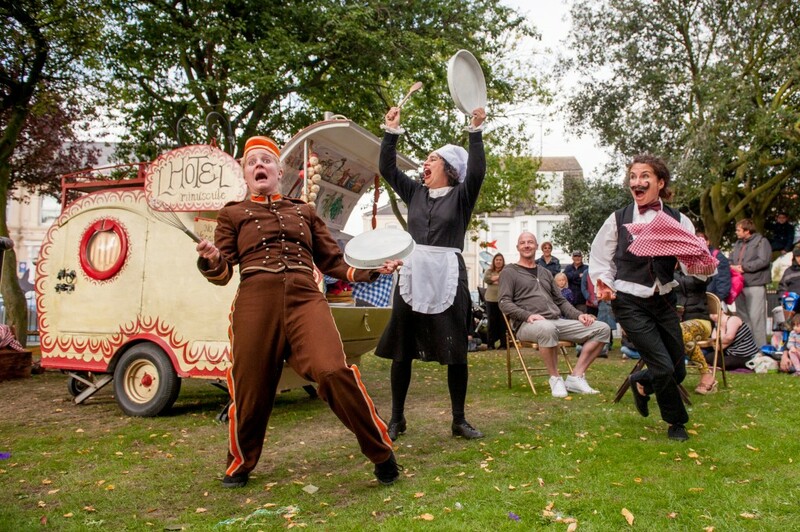 From there, the festival spreads out to locations across Great Yarmouth. This year we are exploring Blackfriar’s carpark and Deneside Green as performance spaces. Yes, there will be various food stalls of different cuisines in place around the park, plus the amazing Mermadelica! Buon appetito! The Drill House will also be opening itself up to The Festival Lounge this year; a place to kick back and relax from the festival hubbub. Will I be able to see every show? As we fill the weekend with a large number of shows, it may be difficult to watch every performance. Certain shows will have multiple performances throughout the day so careful planning with the diary at the back of the brochure will help you in seeing every show. Spoiled for choice? Get in contact with us on Facebook or with our volunteer team during the festival for recommendations. Where can I get a programme? Your sense of humour and a willingness to have fun! We do recommend you bring something to sit on (we do provide benches and mats but something a little personal wouldn’t hurt) and your phone camera to share the memories with your friends and families (and us! #outtherefest). How about some spare change for our donation barrels? You can ensure we continue to deliver outstanding performances every year. Can I take photographs during the event? Are there any age restrictions to any of the events or activities? Some shows will have a recommended age, information can be found in the brochure and on the website listings.